Svenska Kulturfonden i Björneborg (SKiB), Pori Regional Tourist Agency MAISA and Come to Finland Publishing organised a Travel Poster competition for the region of Satakunta in Western Finland. Goal was to capture the region of Satakunta on a poster in a tempting, smart and even humoristic way. I am more than honoured & humbled to be the winner of the first price with a poster called “Siikakeitto- Whitefish soup”. “Siikakeitto-Whitefish soup” was part of the touring exhibition Come to Finland – Paradise Calling at Mikaelsgården in Pori (18.10.2016-13.1.2017). The exhibition showed almost one hundred Finnish travel posters through which it portrays the story about the unknown Grand Duchy of Finland that became the Land of Romance. The winning poster was also shown in spring 2017 at the National Museum of Finland in Helsinki as a part of the exhibition showing at the museum to celebrate the 100 years of independence in Finland. 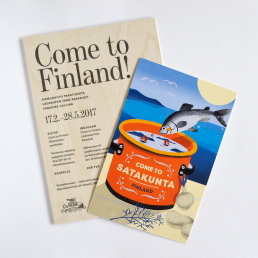 Siikakeitto-Whitefish soup is available as a poster & postcard at Come to Finland’s web shop & retailers in Satakunta.